Bernax works for the big names in international motorsports, but also for smaller companies. We are proud to have done so many successful events over the years and to have received good testimonials. Some of our customers are not directly involved in motorsports but their business models relate to speed, focus, agility and high performance; important values in (motor) sports and for Bernax as well. 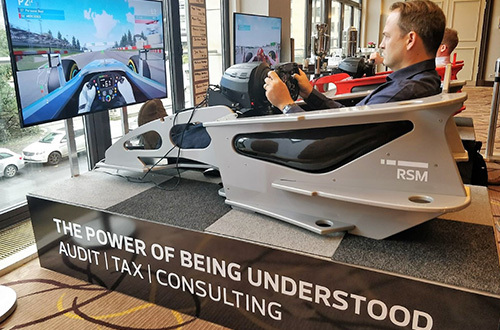 Good to know that if you rent a Bernax simulator you can be sure that we do the best we can to make your event a success! For Tag Heuer we organised an F1 simulator event in Amsterdam. Tag Heuer is the official engine-sponsor and team partner of the Red Bull Racing Formula One Team. We really love to hear this, especially from someone who really knows what he is talking about. A nice response from a big event agency from Berlin. Over the years, we have done many great events for our customers. Would you like to have more background information on these cases? Please do contact us!